The aim of hemodialysis machine is to replace the vital kidney functions. But in most cases this ‘artificial kidney’ cannot replace the vital kidney functions. But in most cases this ‘artificial kidney’ cannot replace the total kidney operation. The hemodialysis machine propels the patient’s blood and dialysate through a dialyzer. The newest dialysis machines on the marketplace are extremely automated and constantly check different parameters including blood flow rate, dialysate flow rate, dialysis solution conductivity, blood pH, temperature etc. Any evaluation that is out of usual range, triggers an easy to hear alarm to aware the patient care technician. An extensive water filtration system is totally fundamental for hemodialysis machine. If the water utilized amid dialysis method not carefully filtered, mineral contaminations or bacterial endotoxins can go into the patient's body to cause numerous health problems. Hence water utilized as a part of hemodialysis machine is precisely purified before utilize. At first it is filtered and temperature balanced and its pH is rectified by including an acid or base. Primary purification is finished by forcing water through a penetrable with very little pores. This membrane is called reverse osmosis membrane. This gives the water pass through and holds back even very small solutes. Once filtered water is blended with dialysate concentrate, its conductivity would increases. 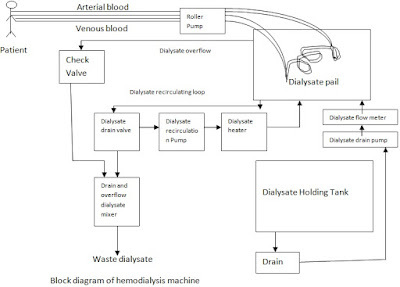 Amid dialysis the conductivity of dialysate solution is consistently checked to clear that the water and the dialysate concentrate are blended in proper proportions. 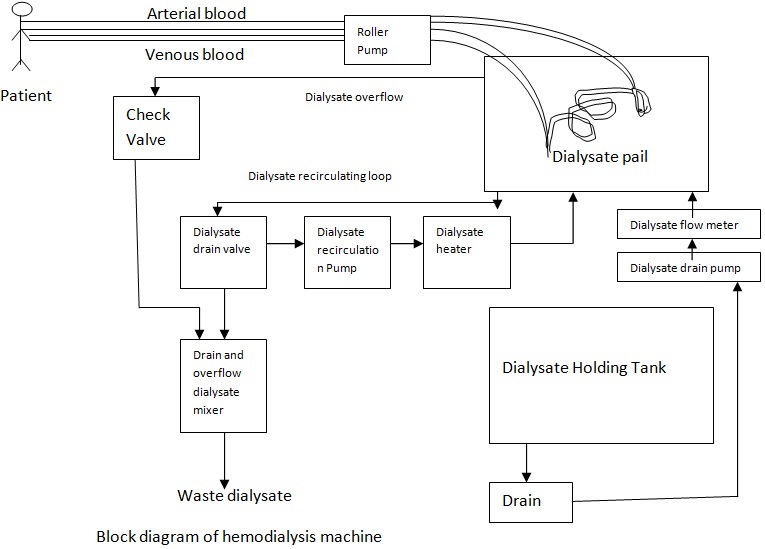 The block diagram representation of a hemodialysis machine is shown in figure. The blood is occupied from the artery of the patient and mixed with an anticoagulant such as heparin and forced into the equipment called artificial kidney or hemodialysis machine. Dialysate pail is the storage place of the dialysate. It is through the dialysate that the blood from the patient is directed to flow through channels or tubes bounded by cellophane membrane. This membrane is permeable to small solutes and impermeable to macromolecules. Dialyzer is the major part of equipment that actually filters the blood. Dialyzer membranes have dissimilar pore sizes. Those with lesser pore size are called low flux membrane and those with bigger pore size are called high flux membranes. Dialyzer membranes used in made of cellulose. Another group of membrane is made from synthetic objects using polymers. Nanotechnology is used in some high flux membranes to produce uniform pore size. Dialyzers come in numerous dissimilar sizes. A bigger dialyzer with a bigger membrane can remove more solutes. The dialysate should be kept at a proper temperature. The temperature is controlled by the dialysate heater. The function of dialysate check valve is to control the flow of dialysate to the dialysate pail. If the overflow condition of dialysate occurs, it will be directed by the check valve to the dialysate overflow and drain mixer where the dialysate will be mixed with the drained dialysate. The mixed component is thrown out as exhaust. This loop acts in such a way that the drained dialysate is reconverted into fresh dialysate and properly heated and redirected to the dialysate pail itself. The dialysate may moreover be discarded after each action or be used again. Reused dialyzers are not shared between patients. If the reuse of dialyzers is finished cautiously and properly it will produce similar outcomes to a single use of dialyzers. The dialysate holding tank holds the fresh dialysate and whenever the dialysate of the pail has to be changed, the fresh dialysate from the holding tank is taken to the pail. In order to regulate the flow of fresh dialysate from the dialysate holding tank to the dialysate pail, we normally use a flow meter in the machine set up.